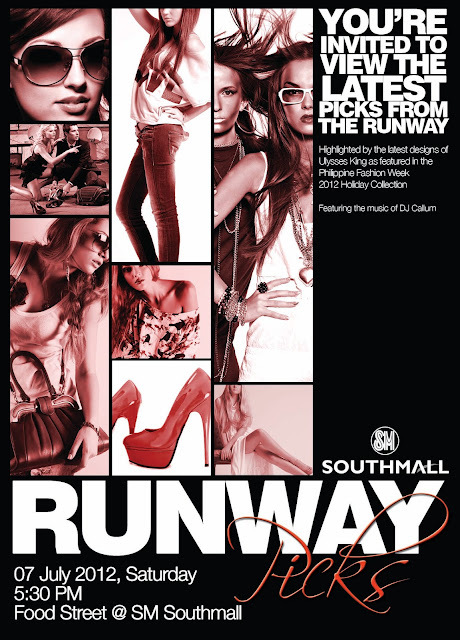 SM Southmall would like to invite you to view the latest fashion picks from the runway. Showcasing the newest collection from the following fashion brands: SM Department Store’s SM Ladies Fashion & Girls Teens’ Wear, Charles & Keith, F&X, 3 Stars & A Sun, Jag, Just G., Human, Kashieca, Levi’s Mags, Le Jean de Marithe Francois Girbaud, Mendrez, Michelis, Osh Kosh B’gosh, Parfois, Payless, Peppermint, Periwinkle, Petit Monde, Plains & Prints, Promod, Sabella, Shubizz, Bench, Blue, Inc., Celine, Tomato, & Yves Rocher. Latest designs from young designer Ulysses King will also be featured in the fashion show. Model & DJ Callum David will play music to entertain guests.